PicPocket Books has been at it once again with another winning interactive story application. Added to their collection, a print form book turned mobile, Snuggle Mountain for the iPad device is definitely one you won’t want to miss. 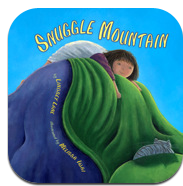 Snuggle Mountain would be a wonderful addition to any home library as well as a classroom environment. Designed to meet the needs of those just learning to read as it builds ones imagination. There are a number of app development groups that specifically design a variety of children’s books for the mobile learning market, but PicPocket Books adds a piece unlike any other. Their book apps include questioning and connections to both home and school for purposes of extended communication. Through these extension activities, readers will be meeting the necessary goals for early elementary students as they practice reading and developing upon key vocabulary such as: characters, setting, and beginning/middle/end. Snuggle Mountain is just one of the many interactive books that PicPocket Books has to offer which will spark a readers higher order thinking skills. For these simple reasons, Snuggle Mountain is applicable to you. Upon entering Snuggle Mountain, readers are immediately interacting with the story as they touch the main character, Emma, her dog and cat from page to page. Although the cat and dog may not have something new to say, Emma certainly does. This was a pleasant surprise on our part! With a great deal of details and various forms of figurative language, author Lindsey Lane has written a story which you can truly picture in your mind without even seeing with the help of what appears to be a young narrator. It’s a story app that opens ones creativity and imagination. Come climb Snuggle Mountain and envision enormous giants as they are trapped in a sleeping spell. Illustrated by Melissa Iwai, she has encompassed in her drawings things of the real world as it plays on your eyes and what is not real. Young readers will be asking such questions as: Will Emma get to the top? What will she find? What will break ones sleeping spell? As you read as a family, individually, or in a classroom, make a connection to your own morning routine as you go on an amazing adventure. Leave with not only a story having been told, but also a special surprise at the end! Applicable2U definitely gives Snuggle Mountain a thumbs up! Through this developmental collaboration of people, a wonderful story is told and can be enjoyed no matter where you happen to be. If you would like to learn more about PicPocket Books, please click here to visit their website. If you have a young child, boy or girl, around the ages of 4 – 6, then it’s time to snuggle up and read. You can click here to begin downloading Snuggle Mountain to your iTunes library today! Wow. What a fabulous review! And what a great surprise to find as I was searching sites that review children’s book apps. Thank you for taking the time to review our app. It means a lot.